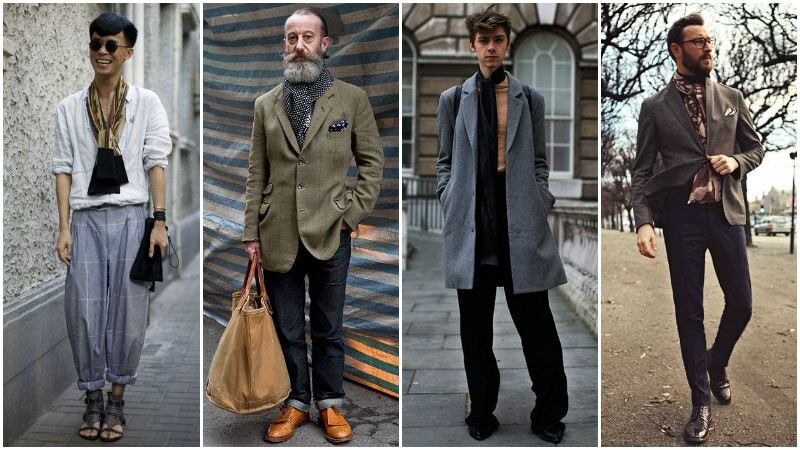 A scarf is an ideal defence for a gentleman looking to fight off the cold. Not only will it protect you from the cool wind and icy air, but it promises to make you look good while doing so. All you need is the right scarf and the right knot and you’ll be both dapper and toasty warm in no time. So, if you must slug out those long winter months, why not look good while doing it? 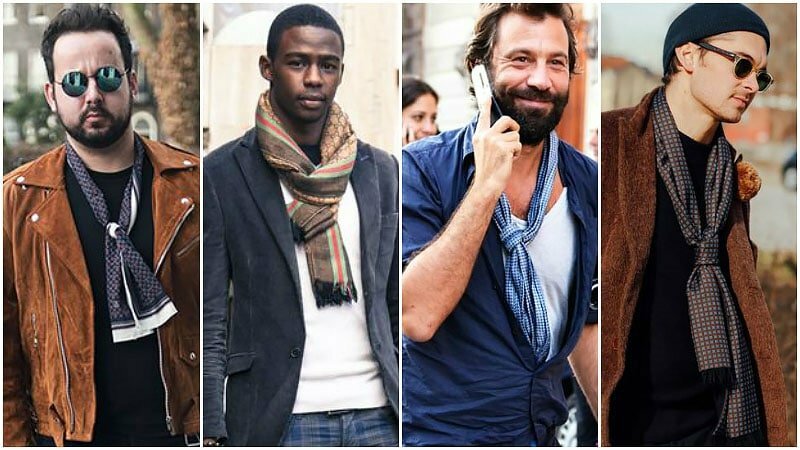 Here’s how to look stylish and suave with your scarf this chilly season. Although the Drape is quite possibly the simplest way to wear a scarf, it also carries a great deal of style. Formal and sleek with an edge of nonchalance, the Drape allows your scarf to become a great accent piece, upgrading the rest of your outfit with it. 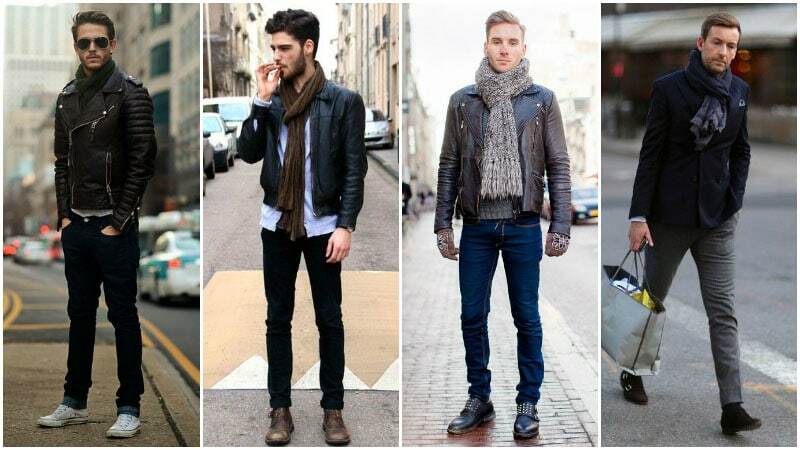 Despite not keeping you all that warm, this scarf style is a useful and versatile option to keep in your arsenal. A perfect addition to business and semi-formal looks, the Drape can be worn over or under coats, blazers and jackets. As you may want to wear it on the outside, be sure to choose a medium or long length scarf to stop it from blowing off your shoulders. Also be sure, however, to choose a style that isn’t too thick to fit under your lapel when needed. Hang your scarf around the back of your neck. Adjust ends at the front to create your desired look. Even lengths will appear more polished while uneven sides will give off a relaxed vibe. Once you’ve created the Drape, you can modify it into the Reverse Drape by crossing the sides of the scarf over each other in front of your upper chest. Finish by flipping the ends back over your shoulders. Both the Once and Twice Around offers a great balance between polished and relaxed styles. 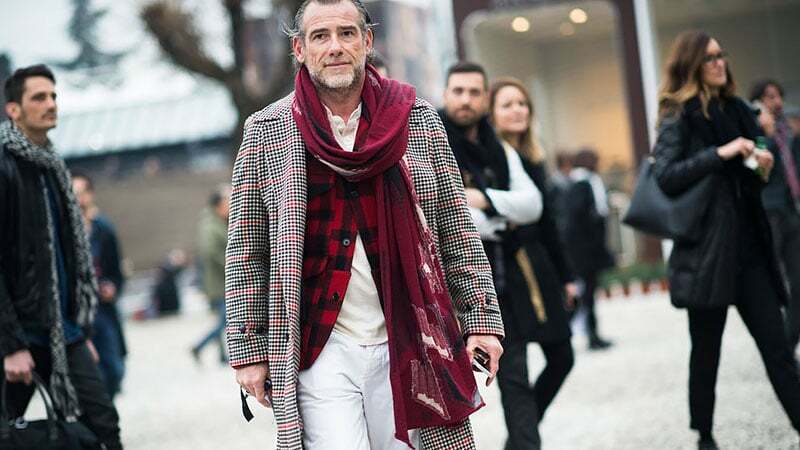 Looking superb with anything from a winter coat to a tee and cardigan, these two ways to wear a scarf can quickly and easily up the fashionability of any outfit. Although the style can be prone to unravelling, it is effective at keeping your neck warm during cold weather. If one end starts to become longer than the other, don’t stress. This style looks just as great messy as it does neat and tidy. Just remember to choose a medium length and weight scarf for the Once Around and a longer and slightly thinner style for the Twice Around. Start by draping the scarf around your neck. Adjust the scarf so that you have around 1/4 of the length on one side of your neck and 3/4 on the other. Pick up the longer side and wrap it around your neck once. The sides of your scarf should now be even with the middle section wrapped snuggly around your neck. To create the Twice Around you will need a much longer scarf than you do for the Once Around. Generally, an extra foot of length will achieve the desired result. 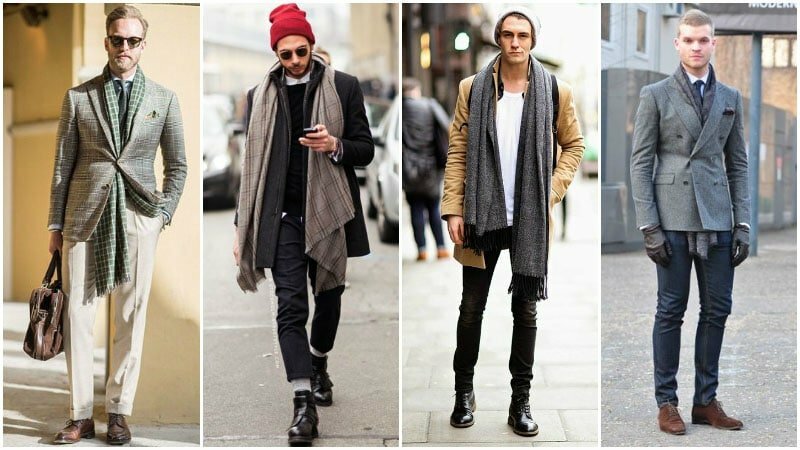 Start again by draping the scarf around your neck. Adjust the length so that you have 1/8 of the scarf on one side of your neck and 7/8 on the other side. Take the long end of the scarf and wrap it twice around your neck. If the ends are still quite short, tighten the scarf around your neck and tuck it into a done up jacket. The Over Hand and the Wrap Around are two more formal ways to wear a scarf. Also known as an Ascot and a Double Ascot, these two knots are perfect to wear tucked into a blazer. Both functional and stylish, they’ll each provide you with some warmth and a whole lot of sophistication. While both the Over Hand and the Wrap Around look good with subdued patterned designs, the former will call for a medium length scarf while the latter requires a long length. Also be aware that by choosing a thinner scarf you can instantly transform this look from polished to bohemian. Start with by creating a drape with 1/3 of the length on one side and 2/3 on the other. Wrap the long end of the scarf over and around the other side, threading it up and through the centre. Pull the end down, so that the long side sits on top of the knot and the other side. Wear the knot loose or tight depending on how you like it. To create this version of the Over Hand, you will need to start with a long scarf. Drape the scarf around your neck leaving 1/4 of the length on one side and 3/4 on the other. Wrap the longer side once around your neck. Now complete the knot the same way you did for the Over Hand. Despite having different names, the Parisian, French, and European knots are all the same when it comes to tying a scarf. Perfect for a night out, this easy knot is adept at providing essential warmth while looking stylish. Appropriately masculine and polished, the Parisian knot is ideal for turning casual outfits into well put together looks. To pull off this look, however, you will need a seriously long scarf as a medium length just won’t cut it. Also, be sure to choose a scarf that isn’t too thick or bulky. As you will be doubling up the fabric, a thick scarf can quickly make your look appear disproportionate when wrapped around your neck. Start by folding the scarf in half lengthways. Drape the halved scarf around your neck. Thread the loose ends of the scarf through the loop created by the folded end. Pull the scarf so that the knot sits snuggly around your neck. The Fake Knot is a handy technique for when you want to make a statement without looking too done up. Not too difficult to create, the look is perfect to pull out every weekend in autumn and spring. It won’t keep you all that warm, but it will stay in place and keep you looking suave. Wearing this knot is also the perfect opportunity to try out daring patterned and silk scarves. While these scarves may look over the top with Once Around and Parisian Knot styles, they’ll look perfect slung around your neck with a fake knot. 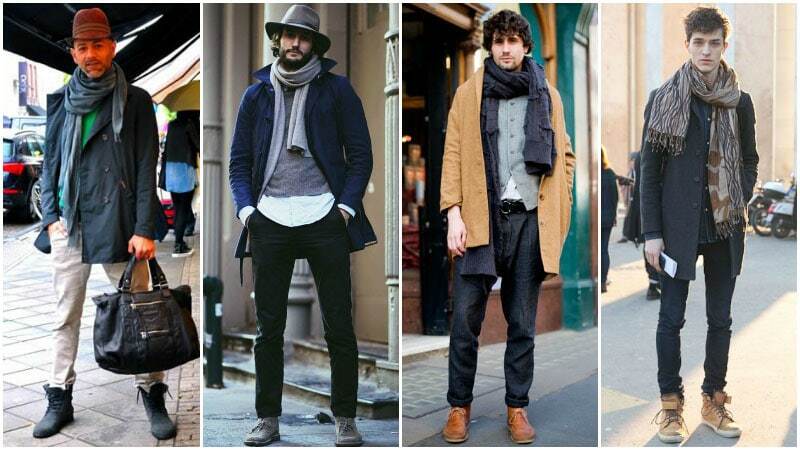 If it’s a bit cold, however, you can also opt for slightly bulkier options such as cashmere or lightweight wool scarves. Just remember, though, the bulkier the fabric, the longer you will need your scarf to be. Adjust the scarf so you are left with 1/3 of the length on one side and 2/3 on the other side. Take the side that’s 2/3 in length and tie it into a loose, simple knot. Now, take the other side and thread it through the loose knot. Pull the knot to tighten it together, but be sure to leave it low and not too close to the neck. The upper chest is an ideal height for the knot. Finish by adjusting the ends to be even or uneven depending on how you like it to look.